As there has been so much rain lately, it’s quite coincidental that the loaf of bread we got at the weekend slices into cloud shapes! 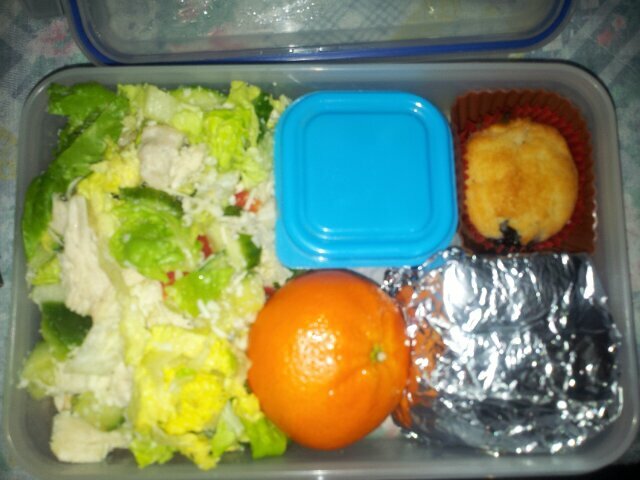 So todays bento for the boyfriend is a two tier one (in the small square systema boxes) with cloud sandwiches! 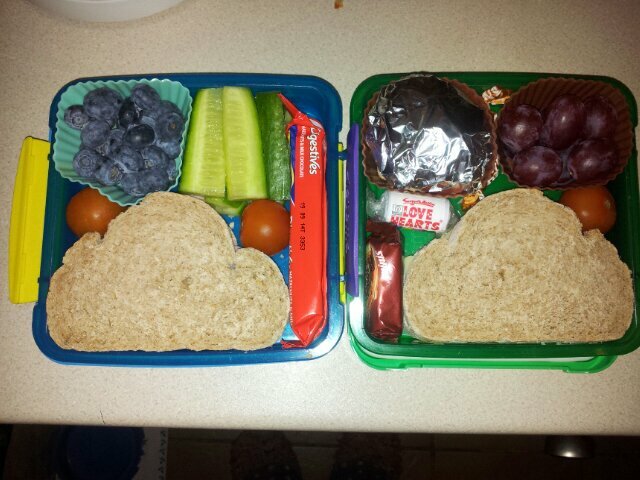 One sandwich is cheese and the other is ham, for sides he has cherry tomatoes, cucumber, grapes, blueberries, a cereal bar, homemade choccy shortbread (in foil), unsalted cashews (under the shortbread and a couple of sweetie treats. I know the point of bento is to make healthy and nutritious lunches, so being samey isn’t a problem, but sometimes I do like to make an extra bit of effort. Cucumber nigiri (that works right), sliced rosemary chicken with a cucumber salad for a side. 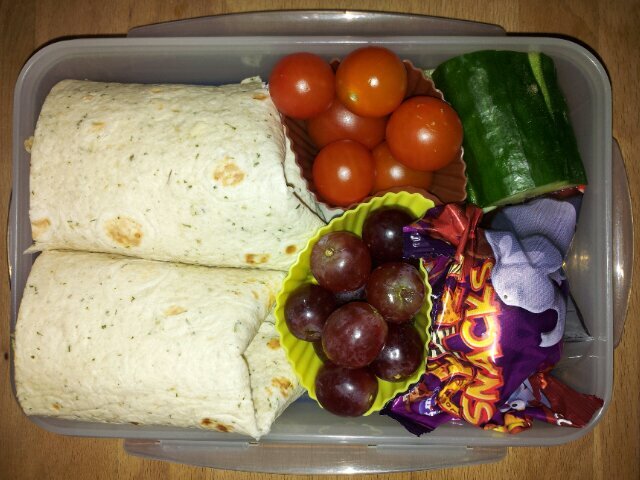 With extras of: rolls of ham and cheese, sushi rice, cherry tomatoes, soy sauce fish, grapes and cereal bar. Overall, nice and healthy, and Japanese inspired! 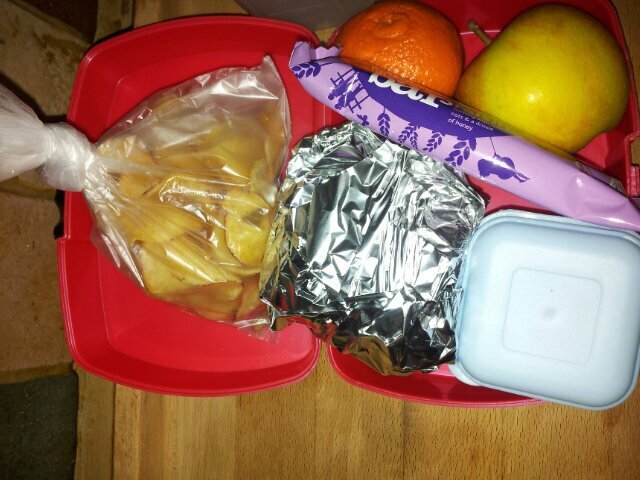 What Japanese inspired food do you make for your lunchboxes/bentos? Good old salad with lots of green stuff! Yay for olives! 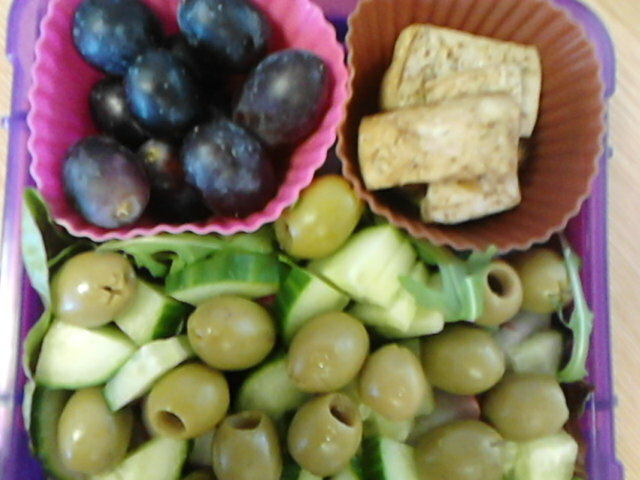 Baked tofu (baked in sesame oil and soy sauce) and red grapes. I had rice cakes with this and it was super yummy! Got any races/events coming up? Or how is your general gyming/exercise going? What would you recommend I start eating more of in prep for race training/increased exercise in general? 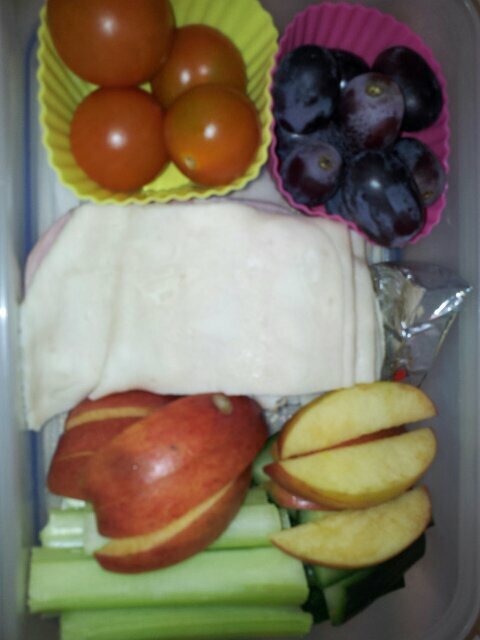 I had cherry tomatoes, grapes, chicken and ham slices, a dairy lee cheese triangle, apple, celery and cucumber. I took along some crispbreads and some hummus to go with this as well. 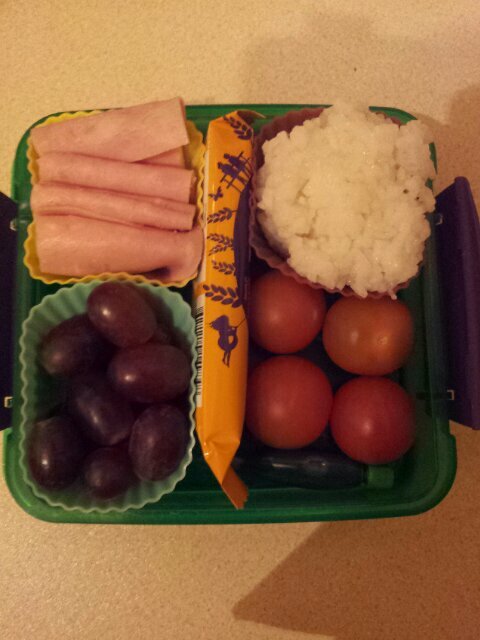 I do try and make bentos healthy but sometimes I get stuck in a rut. 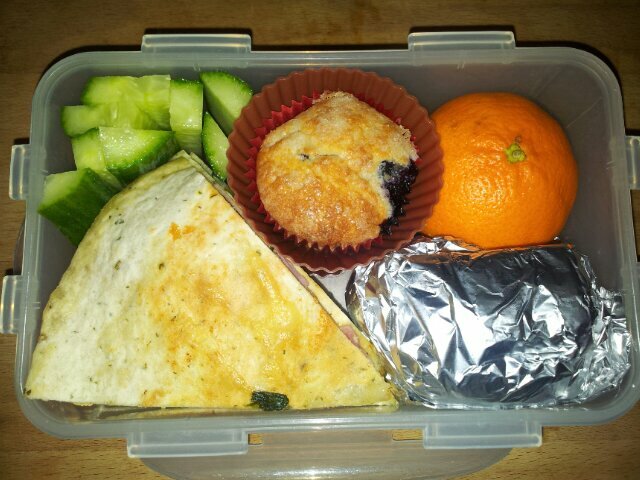 They all like sandwiches and wraps but sometimes it’s nice to have a different kind of bento. This bento is the boyfriends. He has roasted vegetables, cous cous and tuna mayo (leftover from a jacket potato dinner) in one half. 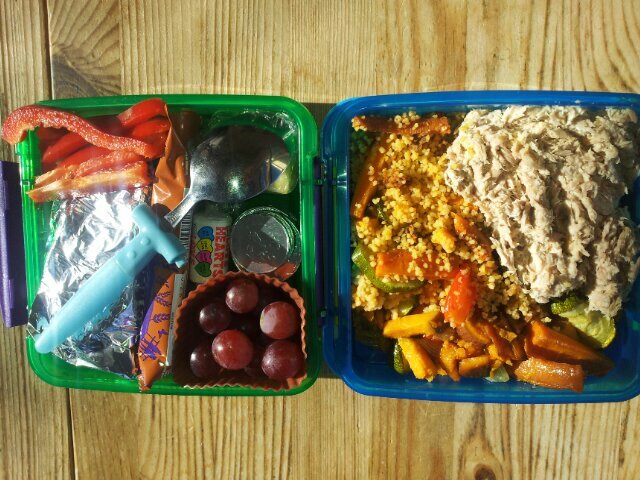 In the other half are grapes, red pepper, a cereal bar, an oat and raisin cookie (in foil), a cheese cube (under the spoon) and sweetie treats. It is definitely very different to sandwiches or wraps! Do you have the same lunch everyday or do you try to mix it up a bit? 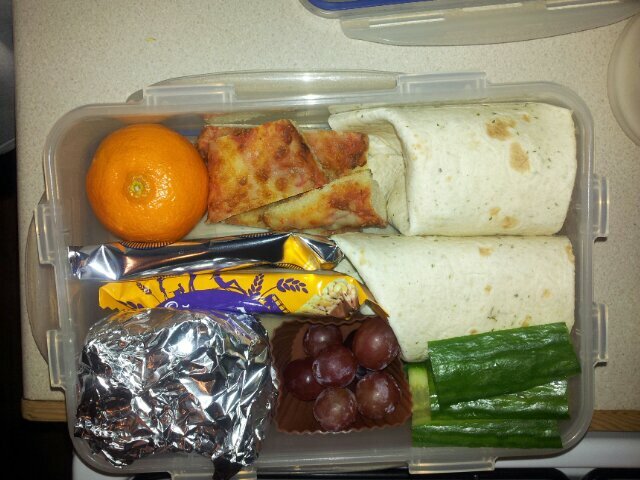 Cheese salad wraps, cucumber, red grapes, malt loaf (in foil), cereal bar, oreos snack pack, satsuma and leftover pizza. He also had nuts and an apple for snacks. 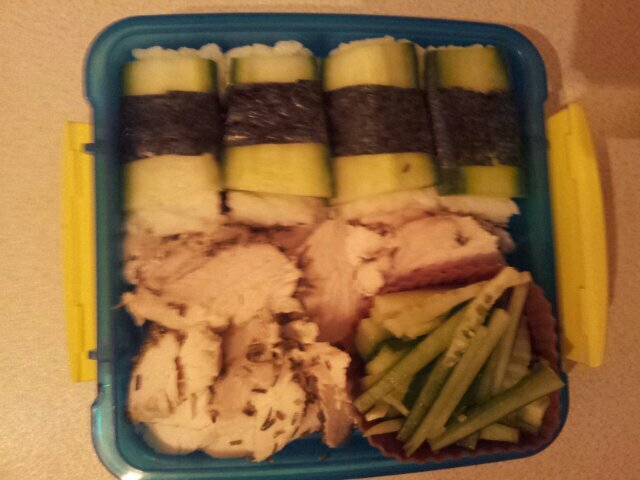 Todays bento belongs to the boyfriend. 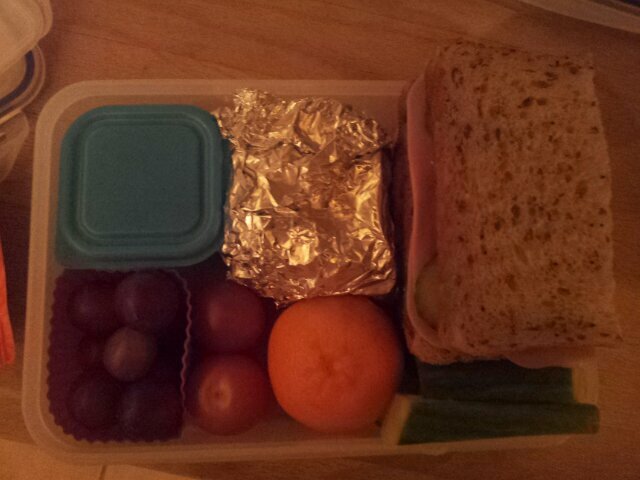 This bento contains a ham and cheese salad wrap, cherry tomatoes, grapes, cucumber, cheese triangle and a snack pack of choccy animal biscuits. These snacks are for him to eat throughout the day. 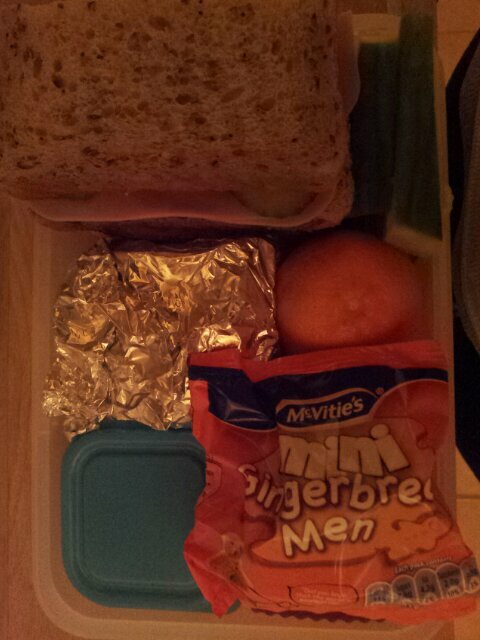 He has malt loaf, a few crisps, fruit, a cereal bar and unsalted nuts (in the blue lidded pot). If I had a lunch that big I might go pop!